I’ve a confession to make—the moment I was greeted by the recognisable refrain of Quincy Jones’ Soul Bossa Nova (aka The Austin Powers theme song) and the cheeky-grinned offer of a reviving gin and tonic, it became quite apparent that it was going to be very difficult not to like New Punjab Club. It is helped, in many ways, because Hong Kong is precisely starved of restaurants in this particular genre—a proper curry house with character and a seethingly hot tandoor, wrapped up in the kind of environment that teeters the line between casual, colonial, and just plain camp. At times, we feel as though we’ve arrived on the set of the Truman Show and we’re Jim Carrey; service is pinpoint sharp, and injected with just the right amount of initiative and bonhomie. But then we realise that our bright-eyed, Cockney accented waiter Brian works the room equally—it’s reminiscent of the big and bold service that patrons of Carbone, also by the Black Sheep Restaurants group, will be familiar with. It's exhausting to watch, but the camaraderie is much appreciated. Hong Kong is precisely starved of restaurants in this particular genre—a proper curry house with character and a seethingly hot tandoor, wrapped up in the kind of environment that teeters the line between casual, colonial, and just plain camp. But of course they want you to have a good time—the group’s 15th hit is a personal project of co-founder Syed Asim Hussain, a proud Punjabi who, with this restaurant, has paid homage to his father’s Hong Kong curry house, The Mughal Room—said to be a real hotspot back in the 80’s. Will the prodigal son, who left a career in NYC banking to return to the hospitality industry, carry on the good name? His first brilliant move was to draft in the talent of chef Palash Mitra of Gymkhana in London, one of my personal favourites—the result is a menu that is tightly curated, with dishes that skirt from updated street classics (smashed samosa chaat with its trendy cap of tamarind glaze and scattering of pomegranate seeds) to proteins properly charred within the hot walls of the tandoor, an original rescued from the Mughal Room. From the latter part of the menu, we opt for the line-caught cobia, a rich and meaty fish that can withstand the oven’s unrelenting heat. The flesh is imbued with the fresh hum of dill, which gives way to the smoky undertone from the tandoor. A tiny dish of what is described as tomato chutney is really a zingy cherry tomato salad, enlivened with sinus-clearing mustard—a helpful foil to the rich savouriness of the fish. Luscious, thick curries such as the Mughal Room makhani (butter chicken, to you and me) beg for a swipe with the smoky, freshly-baked naan breads while keema pau combines the magic of fluffy milk buns with spiced, ragu-esque minced lamb to be topped with sweet, punchy red onion and a squeeze of lime. You’ll want an extra order of the buns, which owe their crisp, golden facets to what is clearly a lot of butter (or ghee) in the pan. The dessert menu is compact but attractive, with one refreshing item (a lemon posset with raspberry sorbet), one affogato (made with chai rather than espresso) and one for the metaphorical fat kids (carrot sticky toffee pudding with popcorn ice cream, peanut and banana). The affogato is an inspired update, with a balanced and not-too-sweet chai, but the almond tea biscuit is dry and crumbly, sucking the moisture from our palates not unlike a Jacob’s cream cracker. The sticky toffee pudding, in our eyes, still needs work—on our visit, we suspect a slight heavy-handedness with the salt, as both the ice cream and the pudding tasted too saline to be satisfying. A more buttery, sweet toffee sauce and more complexity in the popcorn ice cream and this could be a winning dessert. 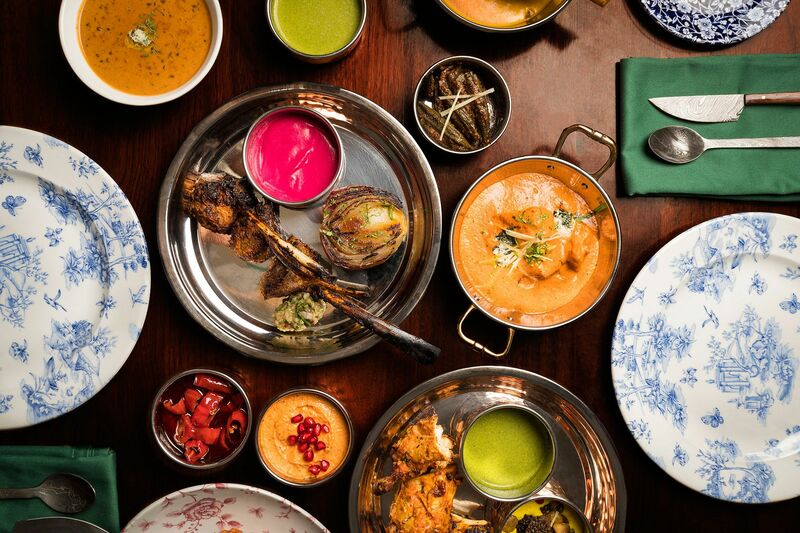 I’ve long been hoping for a restaurant like Gymkhana, or even the likes of Dishoom (a popular London-based restaurant minichain inspired by the Irani cafés of Bombay) to arrive in the city. I’ve since shelved that thought. After all, it is certainly more compelling that New Punjab Club is here—opened, no less, by a Hong Kong-born Pakistani who knows what he’s doing. Sign me up for that permanent membership.